Since learning to spin, I've accumulated a lot of roving. It will take me a long time before I can spin it all... I just got two more pounds of wool! So, I'm learning something new to do with my roving. That new skill is needlefelting. 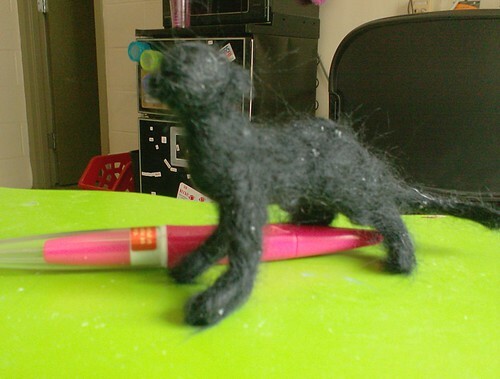 Needlefelting creates matted mounds of fiber by using a sharp, barbed needle poked repeatedly into the fiber. Normally you use wool, but other fibers can be needle felted too. As opposed to wet felting, which can only be done with animal hair fibers, you can needle felt other kinds of fiber such as silk and bamboo. It's a black panther, which kind of-sort of stands up by itself. You have to adjust the legs or it will fall over. It's hard to make long, thin, detailed things like the legs and tail though. It was fun, but it does take a while to get the wool felted together. My felting needle tool has three needles in one, which makes the felting go a little bit quicker. yikes! Is that hair?? Well I'm not any good at knitting it always comes out awful but yours is def admirable! Isn't needle felting fun? Our llama club group made a huge 2'x3' felted wall hanging - it started out as a wet felted piece but the details didn't come out very well so we sat down and started needle felting details onto the felted "canvas". Now to find the time to do more 3-D felted pieces. I sell needle felting kits in my etsy store and they sell very well - everyone has so much fun with felting! Great looking panther, that is so cool! !